Science Fiction authors have made the Moon a popular destination for centuries now: our closest celestial neighbor is home to hundreds of stories. Ian McDonald’s latest novel, Luna: New Moon, is probably one of the best set there. Taking place in 2110, McDonald pulls us into the deadly world of industrial politics and drama. Five families control the moon: the Mackenzies, the Asamoahs, the Vorontsovs, the Suns and the Cortas, each handling some part of life, from metal mining to agriculture to transportation to Helium-3 Mining. It’s in this environment that Corta matriarch Adriana Corta is dying, and her company will be handed over to the next generation. The children of the Corta family will shoulder enormous responsibility, and their infighting might destroy everything she’s built, and that’s before her rivals are figured into the mix. There’s some interesting parallels with Robert Heinlein’s own novel about the moon, The Moon Is A Harsh Mistress. McDonald’s lunar civilization operates on some shared elements: companies rule the moon, and its employees are in a constant war against the elements. There’s a real libertarian streak to these inhabited moons, but McDonald manages to do a much better job than Heinlein ever did. McDonald’s five families have established their own sort of order, but rather than show off an idealized libertarian world of chaotic equality, he’s set up a fantastic example of how wealth is distributed to the top and bottom. One of the main characters, Marina Calzaghe, lives almost breath to breath after emigrating to the moon. Upon arrival, people are outfitted with chips and digital familiars that count down how much air they have left before they go into debt - how much time they have before they perish. McDonald doesn’t bludgeon this point: he works it in with a thousand little details, and as Calzaghe’s future is saved after she prevents an assassination of one of the younger Corta heirs, the divide between super rich and poor are pretty stark. 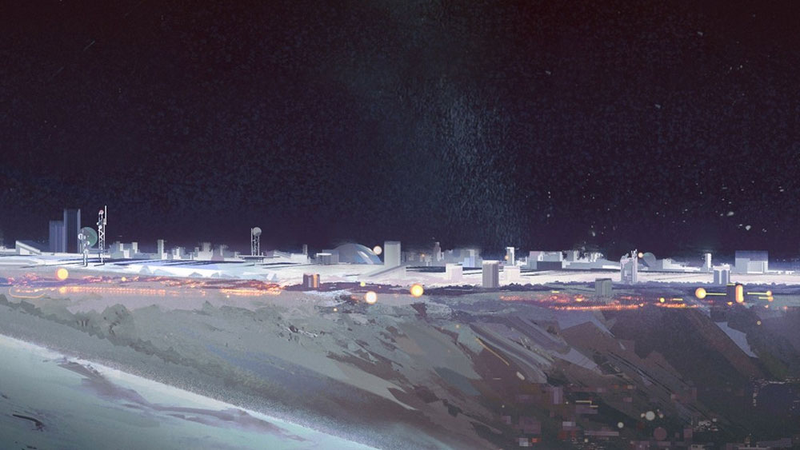 The book was recently optioned to become a television series, and there’s plenty of material for one: the family and rival fighting to control the moon is intense and exhilarating to read. Interspersed with the narrative about the families is Adriana Corta’s own story: how she went from Brazil to the Moon, and how she earned her wealth and muscled her way up the ladder to become the fifth dragon of the Moon. Her story is brutal and pragmatic, and it’s worth the price of admission all on its own. What makes Luna such an interesting novel is that McDonald envisions a future that feels wholly realistic. A space-bound civilization isn’t likely going to follow the conventional political and economic models, and rather than back into one idealogical corner like Heinlein, he creates his own. There’s echoes of the past here to be sure, but they’re blended with a whole new vision for how we will live outside of the Earth’s atmosphere. This is an astonishingly good novel, loaded with vivid detail and interesting ideas about politics, dynasties and our future in space. McDonald has written - no, crafted - some of my favorite science fiction novels, from River of Gods to The Dervish House, and this one is probably his best yet.